The machine learning retreat is a place for top executives (CXOs, VPs, directors, business owners, etc.) from a diverse set of companies to get a practical introduction to machine learning. It is a 2 day, 16 hour intensive hands-on learning session when you will go back to school and solve introductory problems using the cutting edge data science methodologies. The course is taught in a way that leaders from non-programming backgrounds can enjoy the thrill of using solving ML problems. Hosted on the sunny beaches of Goa, the program is designed for fun and will be conducted in a free-wheeling back to school environment. Experience of being a ML engineer ! 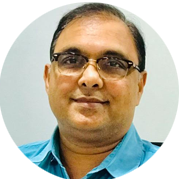 Sujit Bhattacharyya is a founder of CL Educate and has been the heading the technology and innovation efforts in CL for the past 18 years. Prior to CL he worked in the bay area of California, Wipro and Tata Motors. Sujit is a hands on technologist who loves to code. He leads the Data Science initiatives in CL, and had developed many data driven models for business, including one which was patented. His recent work in developing personalized voice bots in education resulted in an invitation to the Alexa Advisory Council meeting in Seattle, USA. Sujit is a passionate trainer and has taken hundreds of workshops for students, parents and executives in topics ranging from empathic parenting,leadership and technology. Sujit will be assisted by his young team of data scientists who work on machine learning technologies and have held high rankings on various world wide competitions held on global data science platforms like Kaggle. The fee for the program is USD 2400 USD 1800 + taxes for participants who opt for a single room and USD 2000 USD 1500 for participants in twin sharing rooms. A 25% discount is on offer till 1st Apr, 2019. The fee includes your hotel stay for two nights, including all meals and cocktails during the event. A special group pricing is also available for groups of two. The fees for the program is USD 4000 USD 3000 + taxes for two in individual rooms and USD 3300 USD 2500 + taxes for twin sharing. Check in on the evening before the Day 1 or Day 1 before breakfast at the latest as the program begins at 9am. Check out Day 2 evening. The course fee includes your stay for two nights and all your meals. You need to pay and arrange for your travel to and from the destination. How do I pay? is there an option to pay in INR ? You can pay online on our site. The cost of the program in INR is as per the current exchange rate. Any issues or queries? Contact us at mythreya.lingala@careerlauncher.com and we'll be happy to resolve any queries or issues you may be facing. My personal journey of learning about AI and ML started a couple of years back. That was the time when, almost with unfailing regularity, I would be be called into our conference room to meet a hot new ed-tech who had a AI driven product to offer. My personal journey of learning about AI and ML started a couple of years back. That was the time when, almost with unfailing regularity, I would be be called into our conference room to meet a hot new ed-tech who had a AI driven product to offer. Phrases like AI, ML, Deep Learning etc would be thrown at us and I would nod sagely with little understanding. Suffering from a uncomfortable fear of being left behind, I enrolled into Andrew Ng's iconic Machine Learning program on Coursera. The experience was thrilling but frustrating too. Andrew would keep things simple, at his level, but I came dangerously close to revisiting the nightmares of very tortuous math taught during engineering. ML today has become far more accessible and easier to learn. I am convinced that data science is not the preserve of the Phds from Stanford alone. There are many aspects of this technology which are hugely useful to managers and leaders on a daily basis. I also believe that there is great value for CXOs to get their hands dirty and solve problems with these new age tools. An experiment conducted in our organization where we put a diverse set of people (from a history honours fresher to mathwiz-engr-mba CXOs) revealed to me how one event could change people's self belief and perspective so beautifully. It is perhaps like that first experience of a bungee jump, the first half-marathon or swim, or the may be your first date ! Till it's done, one doesn't believe it's possible. In this program, you will be treated like a programmer on the first day of your job. While you will simultaneously feel the frustration of learning, you will also savour the thrill of solving some problems, all on your own. You will write code to detect images, analyze natural language, build a voice bot, solve machine learning problems to predict results in real world examples. It doesn't matter if you have never written a line of code before, we will ensure that you get past all the hurdes. Our aim will be to demystify ML at an elemental level, and start imagining solutions for your business with a completely new perspective. Hope to see you in the program !